A pretentious black and white movie with no clear meaning? 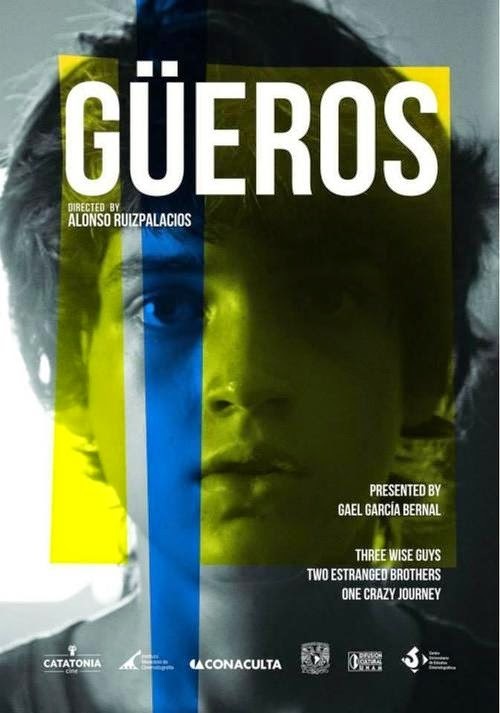 That’s the gist of an extremely meta comment directed at 'Güeros' by a protagonist in one of the film’s wry fourth-wall-poking moments – but it’s a comment that doesn’t accurately reflect the charm of this clever coming-of-age odyssey. Young star Sebastián Aguirre is Tomás: a listless teenager who, in an ill-advised prank, drops a water balloon from a rooftop and has the misfortune of it landing on an unsuspecting baby. It’s the last straw for Tomás’ mother, who packs him off to stay with his equally listless older brother, Sombra (Tenoch Huerta), in Mexico City. The move sparks a complex domino chain of adventures: a foray into the occupied university campus, where students buzz with the rebellion of strike action; a hairy close encounter with a street gang; a trip to the zoo; and a quixotic journey to find fabled musician Epigmenio Cruz – an artist who the two brothers share an intense admiration for, and whose music we never actually hear. If all of this sounds a bit meandering, that’s because it is. The characters are propelled by chance encounters and random coincidences, but somehow director and writer Alonso Ruiz Palacios makes it all hang together in a highly watchable, and frequently beautiful, way. Maybe it’s the stunning cinematography – the contrast of light and shade, echoing the difference between fair-haired ‘güero’ Tomás and dark-haired Sombra – or perhaps the naturalistic, almost improvised style of the performances. For me, though, the most enjoyable element of the film was its uplifting human stories. Even the minor characters that crop up along the way have their own amusing idiosyncrasies and tales of heartbreak and joy to tell. Ultimately, this is a film about love – romantic, platonic, fraternal, love for a cause, love for art, and everything in between – and how it can fill you with purpose. Funny and heart-warming, but never saccharine, this is a thoughtful comedy worth watching. 'Güeros' screened at the 58th BFI London Film Festival.